Radioactive dose assessment improvements for the Nordic marine environment: Evaluation of realistic pathways for potential radionuclide releases. Radioactivity in the Arctic is a central topic within environmental pollution issues (see e.g. link to AMAP below). Sources, both actual and potential, for radioactive pollution in the Arctic are marine and atmospheric long-range transported radionuclides, originating from nuclear power and reprocessing plants (e.g. 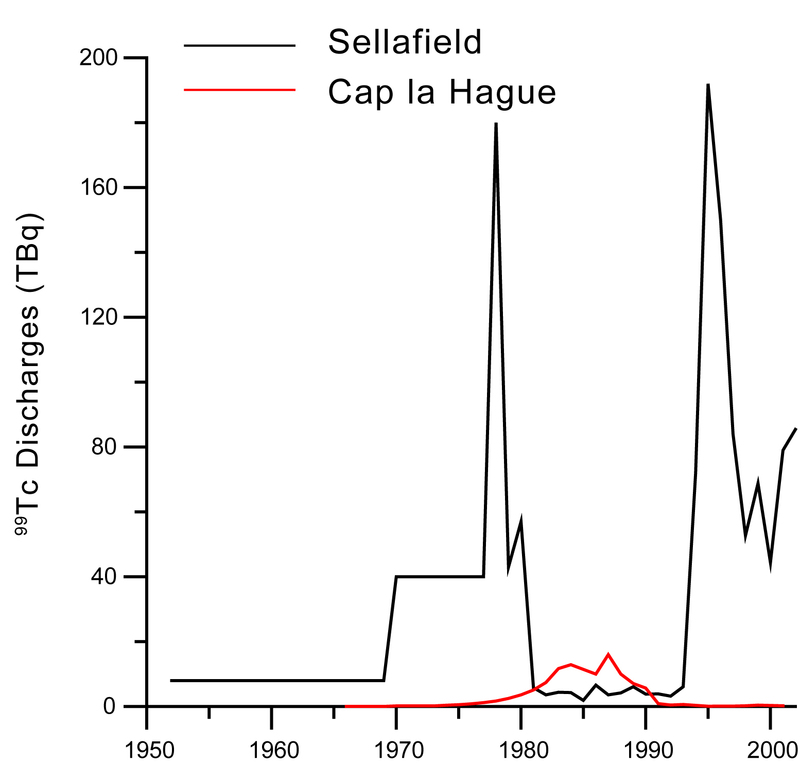 Sellafield and La Hague), dumped radioactive waste, accidents with nuclear powered or armed ships and submarines and global fallout from nuclear test explosions in the atmosphere. Technetium-99 (99Tc), a highly soluble, beta-radiation emitting man-made radionuclide (half life: 2.13.105 yrs.) is one of these polluting substances. Since 1994, enhanced amounts of it were discharged at the Sellafield nuclear reprocessing plant in the U.K.. to estimate the effect of such radionuclides on the environment, including man and biota, dose assessment models are used, one of which is the NRPA box model. It includes numerous features describing the behaviour of radionuclides. RADNOR aims at improving the abilities of this box model further. To further constrain radioactive dose assessments for the Nordic marine environment. 1) The determination of levels and time series of 99Tc in benthic and pelagic food webs. 2) Improvements to the understanding of site-specific and time-dependent sediment-water interactions (Kd), kinetics of accumulation (CF) and body distribution in marine organisms. 3) Improvement of the NRPA box model by the statistical analysis of NAOSIM model hindcasts for 99Tc dispersion, the introduction of selectable flow fields and novel and reassessed abiotic and biotic parameters. · To perform a statistical analysis of flow patterns with the NAOSIM for the period 1948 to present, and to use the dominant patterns as forcing fields to run the NRPA box model in different circulation states. · To further improve the NRPA box model by the incorporation of novel and re-assessed Kd and CF values generated through RADNOR field and laboratory studies. 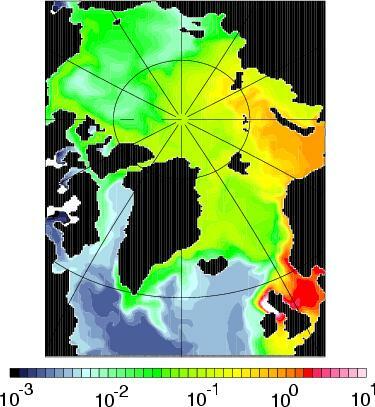 Part of the modelling work has been utilized in the AMAP (Arctic Monitoring and Assassment) Report on Radioactivity in the Arctic 2002 which apeard 2004. RADNOR is funded by the Norsk Forskningsradet (Norwegian Research Council) for the period 2003 to 2005. Dowdall, M, Gerland, S, Karcher, M, Gwynn, JP, Rudjord, AL, and Olstad, AK (2005). Journal of Environmental Radioactivity 84(1):111-130. Karcher, M, Gerland, S, Harms, IH, Iosjpe, M, Heldal, HE, Kershaw, PJ, and Sickel, M (2004). Journal of Environmental Radioactivity 74(1-3):185-198. Gerland, S, Lind, B, Dowdall, M, and Kolstad, MK (2003). Journal of Environmental Radioactivity 69(1-2):119-127. Harms, I, Harms, IH, Karcher, M, and Burchard, H (2003). In: Modelling Radioactivity in the Environment, edited by M.Scott. Elsevier, chapter 3, pages 55-86. Harms, IH, and Karcher, M (2003). In: Modelling Radioactivity in the Environment, edited by M. Scott. Elsevier, chapter 10, pages 287-314. Gerdes, R, Karcher, M, Kauker, F, and Köberle, C (2001). Dethleff, D, Nies, H, Harms, IH, and Karcher, M (2000). Journal of Marine Systems 24(3-4):233-248. Harms, IH, Karcher, M, and Dethleff, D (2000). Nies, H, Harms, IH, Karcher, M, Dethleff, D, and Bahe, C (1999). Science of the Total Environment 237/238:181-191. Nies, H, Harms, IH, Karcher, M, Dethleff, D, Bahe, C, Kuhlman, G, Kleine, E, Löwe, P, Oberhuber, JM, Matishov, D, Stepanov, A, and Vasiliev, OF (1998). Click here for attachment folder.